More information about Related Posts for WordPress can be found it’s own website. I’m trying to show related posts below my posts, how do I set this up? I don’t want to get to deep into Post Connector, but it basicly allows you to create many-to-many relationships between (custom) post types (if you want to learn more about Post Connector, click here). To accomplish this the client needs to setup what we called a “connection” to define the sort of relation between post types, and these connections come with quite some configuration. I’ve realized over the past months that while this might make sense to me, because I’m a developer, this can be abracadabra for non developers. And these “non developers” were also using Post Connector, not for the ability to setup these powerful many-to-many connections, but to achieve a fast and reliable way of displaying related posts. As of today you can use the power of Post Connector just to create related posts. I’ve took a part of the Post Connector core and created a new plugin around it. Related Posts for WordPress comes with a plugin installation wizard that will setup the posts cache and, if desired, setup a user configurable amount of related posts automatically. So even when you’ve a got blog with thousands of posts, you can link them all to each other with a single click. Pretty cool, huh? After the initial setup is done you can get back to what you love, writing posts. On the next post you write you’ll notice a new meta box below your content called “Related Posts”. After writing your post simply click the “Add Related Posts” button and make a selection from the pre-selected posts we think are related. And we don’t just suggest related content based on category or tags, we thoroughly scan you posts and determine relation between them based on what you’ve wrote. Another good thing to mention is by using Related Posts for WordPress you’re not slowing down your website. Because we’re caching related posts, and aren’t determining what posts are related on each page view, we won’t lag or stress your server and thereby keeping your website fast. Related posts will be automatically shown below your post. That’s it. No complicated or big setup to get the plugin working. 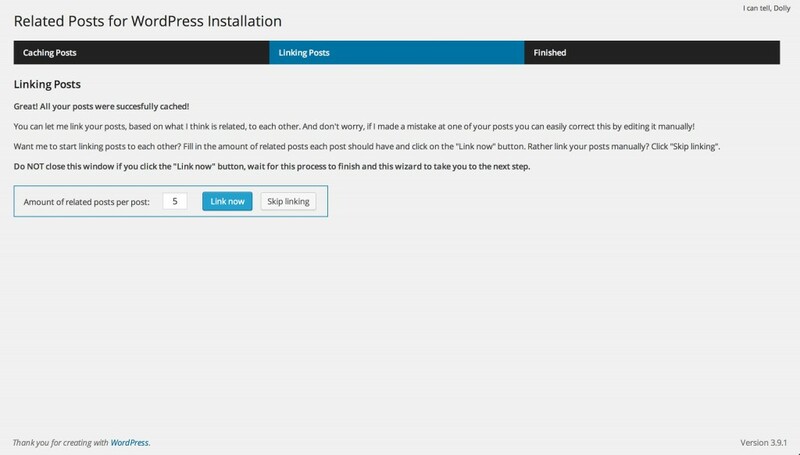 Simply install the plugin and you’ll have real related posts on your website with one simple click. Give it a try now, by downloading it from the WordPress.org repository for free. I’m really happy with how this plugin turned out and already got a lot of ideas for future versions of it. If you have any after reading this post, please do let my know by leaving a comment below. I had been looking for a related posts plugin for sometime. This one really does work! however it does not seem to become activated with new posts……how do I fix this? Thanks for the kind words, glad to see you like it. Currently you will need to add related posts manually after writing it via the metabox. I do like your idea of enabling automatic link also for new post so I will include this in a future version! Does your plugin also works with Custom Post Types. I’ve installed in on my blog which uses different custom post types but I don’t see any new options/related posts setion below the postst…? It does not, and I’m not sure it ever will because I want to keep the plugin as simple as possible. 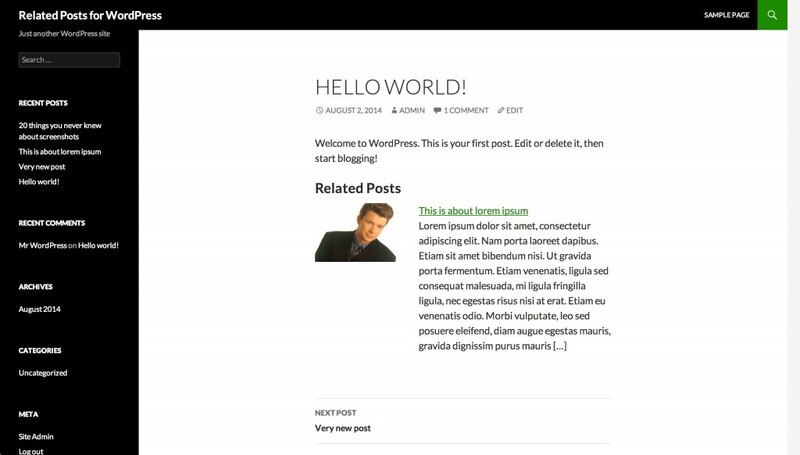 But as you might have read in the post I’ve used the core of Post Connector to create Related Posts for WordPress, and Post Connector does support custom post types! So with Post Connector you can achieve related cross custom post type posts, see the website for more information. I found this plugin and was excited about it, but then I had to find out that it breaks the NextGEN Gallery plugin. Is there a way you can bring compatibility to have both plugins in use the same time? This plugin conflict has been fixed in version 1.2.2 and is now available at your plugin page or via wordpress.org. I am new to WP and just started customising my new website. After the installation of this plugin, I can’t see images in my related posts here and they are coming up in a vertical line instead of horizontal as I have seen on blogs. What am I doing wrong ? please could you advise..
Hi, I really like the plugin, but I’m having some issues with responsiveness. Because I have my ul list set horizontally, my related posts are squished together when viewing my site on a cell phone. Is there a way to have the related posts vertical when on a cell phone? Thanks!